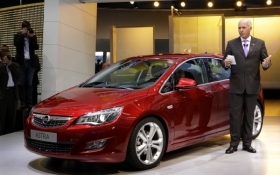 The Astra is a 'mini Insignia,' Opel's Forster said. FRANKFURT -- Opel wants the new Astra to be among the top three best-selling cars in Europe and will price the car starting at 15,900 euros in Germany, the carmaker's chairman Carl-Peter Forster said during the car's unveiling at the Frankfurt auto show. The Astra's base price is 600 euros lower than its main rival, the Volkswagen Golf. The success of the new Astra will be key for Opel's new owners, Magna International Inc. and its Russian partner Sberbank. The model is the top seller for Opel and its British sister brand Vauxhall, accounting for one third of the company's sales. Forster said the new Astra "radiates quality" and is more fuel efficient than the current car. It also offers "high technology that has a practical use" such as lane departure warning, he said. "The Astra has typically been among the top three best-selling cars in Europe and it remains our ambition for it to stay there," Forster said. The latest Astra achieves 12 percent better fuel economy overall compared with the current car. The most fuel-efficient variant has CO2 emissions of 109 grams per kilometer. "We are working on introducing a model with CO2 emissions of less than 100g/km quite soon," Forster said. The Astra is available to order immediately. It is based on General Motor Co.'s new Delta platform, which also underpins the Chevrolet Volt and Cruze. The car has taken most of its bold styling cues from the 2009 European Car of the Year, the Insignia, and it offers many of the Insignia's high-end options as standard equipment. "In many ways it is a small Insignia," Forster said. But he said the Astra also adopts innovations from the Corsa subcompact, such as an optional slide-out bicycle carrier integrated in the rear bumper. GM is selling a majority stake in Opel to Canadian parts supplier Magna and Russian state lender Sberbank, while keeping 35 percent for itself.